Heathcote Cottage in Hickling, near Wroxham, Norfolk sleeps 4 people. Heathcote Cottage near Wroxham is located in the village of Hickling, within walking distance of Hickling Broad; Heathcote Cottage is a stunning semi-detached cottage in the Norfolk Broads National Park. 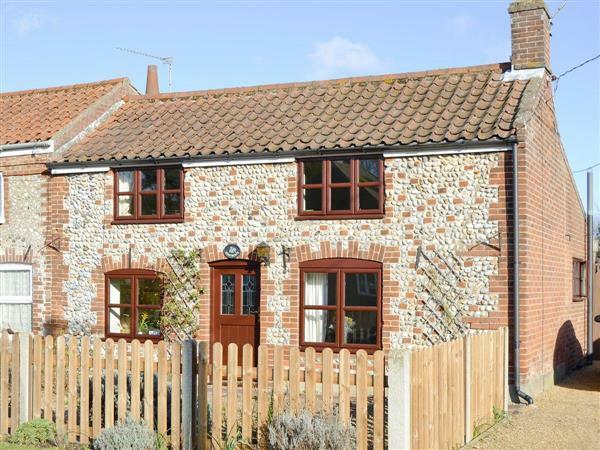 Heathcote has been lovingly renovated with a cosy living room, spacious kitchen/dining room and two bedrooms, accessed via separate staircases, one of which is a traditional winding Norfolk staircase. The property boasts a private hot tub where you can unwind in the evening, after a fun-filled day exploring the area. A 5-minute walk brings you to Hicking Broad, the largest of the Norfolk Broads, particularly popular as a known haven for wildlife all year round. There are many trails and hidden corners, with boat tours available. Common cranes, bittern and marsh harriers can all been seen, as well as kingfishers. The swallowtail butterfly and the Norfolk hawker dragonfly are local specialities, and many people come just to see these two species. Close by you’ll find the Norfolk Coast, and Horsey Beach where you can see the incredible seal colony that make this stretch of beach their home during the winter months. The city of Norwich, the only city in a National Park, is just a short drive away and is filled with heritage and culture including the castle and two cathedrals. The beach is 4 miles from Heathcote Cottage near Wroxham. With the shop and restaurant 400 yards, and the pub is ½ mile from Heathcote Cottage. Living room: With 42 Freeview Smart TV, DVD player and wooden floor. Kitchen/dining room: Farmhouse style with electric oven, induction hob, microwave, fridge, dishwasher, washing machine, tumble dryer and tiled floor. Bedroom 2: With single bed, pull-out bed and Freeview TV. Electric heating, electricity, bed linen, towels and Wi-Fi included. Welcome pack. Enclosed lawned garden with patio and garden furniture. Hot tub for 4 (private). Private parking for 2 cars. No smoking. Please note: There are some low beams (6ft in places) and some low doorways. Holidays at Heathcote Cottage run from Friday to Friday. Pets allowed at Heathcote Cottage. For a better idea of where Heathcote Cottage is, you can see Heathcote Cottage on the map below. Heathcote Cottage is in Norfolk; should you be on the lookout for a special offer, you can find all the special offers in Norfolk. It's always worth checking to see what is on offer at the moment. Do you want to holiday near Heathcote Cottage (UKC2893), you can see other cottages within 25 miles of Heathcote Cottage; have a look to find your perfect holiday location.